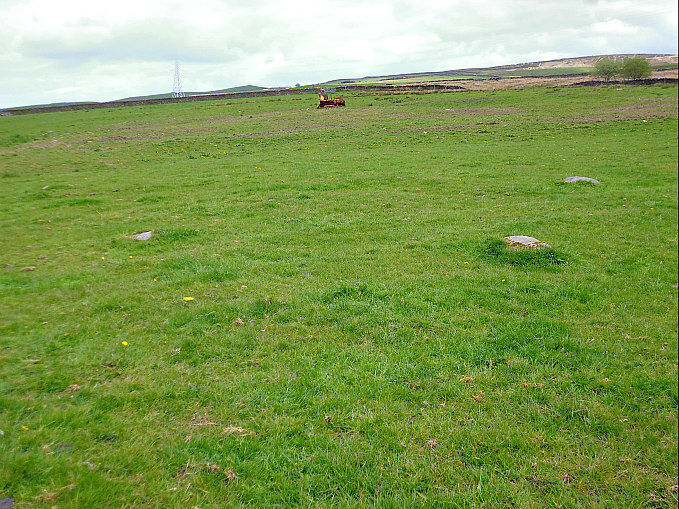 Worsthorne Hill Stone Circle, near Burnley, in Lancashire. OS grid reference: SD 8845 3276. On Worsthorne Hill to the east of Burnley, Lancashire, and close to Swinden Reservoirs, stands a prehistoric stone circle. Though it is not the usual type of stone circle with stones standing up-right. This site is also known as ‘Hameldon Pasture Stone Circle’ and sometimes ‘Slipper Hill Stone Circle’. It has also been referred to as a ‘cairn circle’- and was stated as such on earlier OS maps. To reach the site take the Gorple Road at St John’s Church in Worsthorne. Continue eastwards on this often quite rough track for about ¾ of a mile. Take the track on the left just after Brown Edge Farm, climb over two stiles and continue along the here for 270m, climbing a 3rd wall stile. At the old rusting steam-roller walk to the right down the dry water course for 150m. 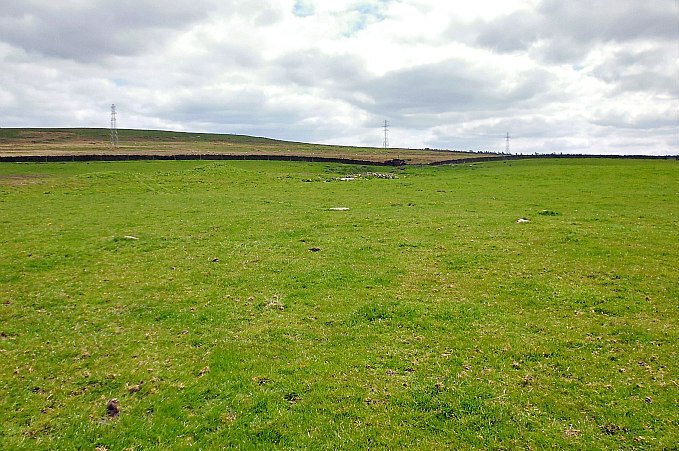 Here in front of you is what remains of the stone circle – now partly surrounded by a land-fill site and field debris scattered about, which is quite appalling to say the least, being right next to an ancient site. A second rusty old road repairing vehicle can be seen beyond the circle! Worsthorne Hill Stone Circle, near Burnley. 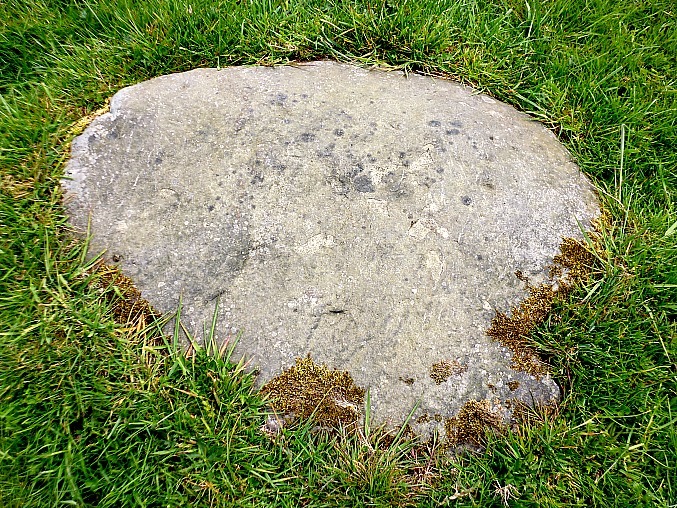 The “possible” cup-marked stone in the stone circle. There is not a great deal to see of this so-called stone circle, if that’s what it is.? Today only 5 recumbent stones remain in a sort of circle, though there may be 2 or 3 others buried under the grass tufts. The largest of the 5 stones at the E side may also have originally been underneath the grass; this stone is about 2 ft vertically. It could ‘possibly’ have a number of tiny cup-marks on its surface where the circular lichen features are visible, or were these made by something else? There is a faint earthen circle, but this feature of is ‘now’ difficult to make out; and it has been suggested by some that the stones were part of an outer kerb. It roughly measures 15m x 12m. So was this a cairn circle? Probably not as there is no burial mound nor any visible sign of one now. This ancient monument probably dates from the Bronze Age. [At the time of my visit it looked like a vehicle, of sorts, had been driven across the circle as they’re were tyre marks]. Categories: Cairn / Cairn Circle, Stone Circle | Tags: Worsthorne Hill Stone Circle near Burnley in Lancashire | Permalink.